Over the past month I had the privilege to be interviewed by a Romanian newspaper woman (Nina May) about Cordwood Construction for the German newspaper Deutsche Zeitung. 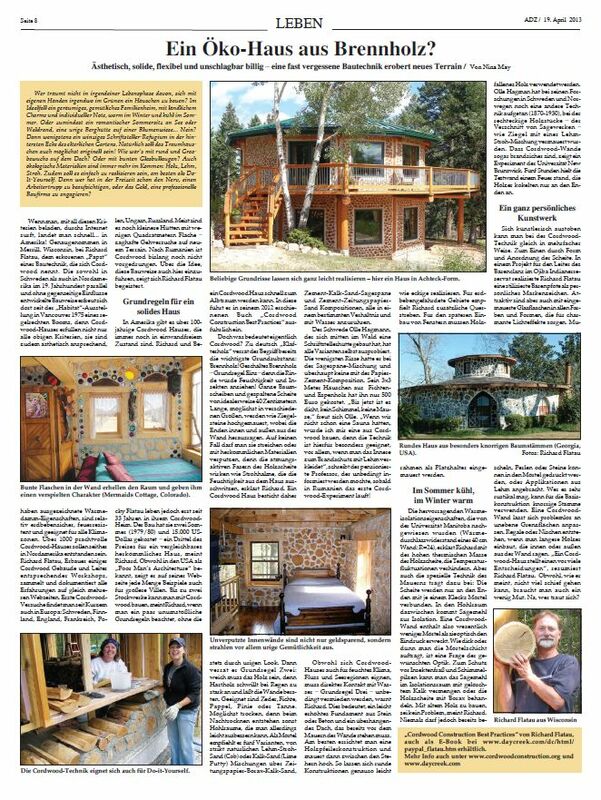 The article covers existing cordwood in Europe and North America and its potential uses in Romania and Germany. Nina was very perceptive about building techniques and was interested in translating the current cordwood craze in North America to her countrymen and women. Here is the article in German and the fascinating translation is below. By Nina May Sunday 21 April 2013 Who has not dreamed of in any phase of life, to build with their own hands a house somewhere in the countryside? Ideally, a spacious and comfortable family home, with rural charm and personal touch, warm in winter and cool in summer. Or at least a romantic summer residence on the lake or forest, a rustic mountain hut on a flower meadow … No? Then at least a tiny writers retreat in the far corner of his parents’ garden. Of course the dream house should also be as original! How about some grass and vegetation on the roof? Or with colored glass portholes? And ecological materials are more and more coming: wood, clay, straw. In addition, it should be easy to implement, best known as Do-It-Yourself. For anyone who has been to engage in leisure the nerve to supervise a squad worker, or the money, a professional construction company? If you loaded with all of these criteria, surfing through the Internet, you quickly end up … in America! In fact, in Merrill, Wisconsin, Richard Flatau, teaches a construction technique which is called Cordwood. Both in Sweden and in North America in the 19th Century in parallel and developed without mutual influences method of construction is there for the “Habitat” exhibition in Vancouver in 1975 of a real boom because Cordwood houses not only meet all the criteria above, they are also aesthetically pleasing, have excellent thermal insulation properties, are relatively earthquake-proof, fire-resistant and suitable for all climates. than 1,000 magnificent Cordwood houses are to be developed in North America since then. Richard Flatau, builder and manager of some Cordwood building appropriate workshops, collects and documents all experience the same number of pages. Cordwood first attempts to find more recently in Europe: Sweden, Finland, England, France, Poland, Hungary, Russia. Most are even smaller huts with a few square meters – tentative steps on new terrain. Cordwood to Romania is not yet penetrated. About the idea of introducing this construction here, Richard Flatau, enthusiastically. principles for a solid home in America there are more than 100 years Cordwood homes that are still in perfect condition. Richard and Becky Flatau but only for 33 years living in their Cordwood home. The building has cost them two summers (1979/80) and $ 15,000 – a third of the price of a comparable conventional house, said Richard. Although known in the U.S. as “Poor Man’s Architecture”, it shows on its website a lot of examples for larger villas. Up to two stories can be built with Cordwood said Richard, if you follow a few basic rules irrefutable without a Cordwood house can quickly become a nightmare. He explains in his 2012 book “Cordwood Construction Best Practices”. Cordwood what does it really mean? To Germans “cordwood” betrays the concept already the most important basic substance: Firewood! Peeled firewood – one basic rule – because the bark would attract moisture and insects! Whole tree slices and split logs of ideally 40 inches long, possibly in different sizes, such as high masonry bricks, the ends protrude inside and outside of the wall. Under no circumstances should you remove them or plastered with conventional materials because the breathable fibers of logs act like straws that exude the moisture out of the house, said Richard. A Cordwood house therefore always offers rustic look. then he reveals two basic rule: soft wood has to be, because hard wood swells when it rains too much, and can burst the walls. Suitable cedar, spruce, poplar, pine or fir. As dry as possible, because otherwise arise during subsequent drying cavities, which can, however, easily repaired. As a mortar, he recommends five variants of strictly natural clay-straw-sand (Cob) or lime-sand (lime putty) mixtures on newsprint borax, lime sand, cement-lime-sand sawdust and cement newsprint sand compositions , all touching in a certain ratio with water. Swede Olle Hagmann, who has built a writers cabin in the woods, has tried all the variants themselves. He had very few cracks in the sawdust mixture and absolutely no paper with the cement composition. His house 3×3 meters of spruce and aspen cost him 500 euros. “Until now it is tight, no mold, no mice,” says Olle. “If we had not already a sauna, I would build one from Cordwood, because the technique is particularly suitable for this, especially when clad the interior of the fire with clay,” says the retired professor, who wants to be necessarily informed once in Romania the first Cordwood experiment running! Although suitable for humid climate, river and lake regions Cordwood houses, have direct contact with water – Principle Three – to be avoided, warned Richard. This means a slightly higher plinth of stone or concrete and an overhanging roof, which should be before the walls of the walls. The best is erected a wooden pier construction and then backed up between the posts. So round constructions can be realized as easily as square. For earthquake zones Richard recommends additional cross braces. For the future installation of windows wood frame must be supported as a wildcard. Cool in summer, warm in winter The excellent thermal insulation properties, which were detected by the University of Manitoba (thermal resistance of a 40 cm wall: R = 24), Richard explained by the high thermal mass the logs to prevent temperature fluctuations. But also the technology that helps Bricklaying: The logs are only connected at the ends with a dab of mortar. Into the cavity between sawdust comes to insulation. therefore A Cordwood wall contains much less mortar than it visually gives the impression. How thick or thin plotting the mortar layer is a question of the desired look. To protect against insects and fungi can mix the sawdust in the insulation space with slaked lime or treat the wood logs with borax. With old wood to build, was not a problem, says Richard. Never, however, already infested wood may be used. Olle Hagman has opened another technique in his research in Sweden and Norway (1870-1930), in rectangular pieces of wood – such as brick walled with a clay-straw mixture – the operation of sawmills were. Cordwood walls that are even fireproof, shows an experiment at the University of New Brunswick. Five hours held the test wall was a fire, the wood charred only at the ends.